I'm listening to the Juilliard Masterclasses at the moment. Fascinating. You can hear Willard White on No. 75 (out of 116) in Verdi: "Il lacerato spirito". 40 years ago today since the death of Maria Callas and it seems her influence is, if anything, more far reaching than ever. To mark the event Warner is issuing a box set of Live Recordings, many of them in roles she never recorded. There has been much discussion as to where they went for their sources, and whether there are still better versions out there. For my money you can't do better than Divina Records or Ars Vocalis, but I've ordered the set anyway and look forward to its arrival later today. There are tributes and exhibitions going on also in Venice, in Paris, in Dublin (where she never appeared), but nothing in London, which from 1952 until 1965 gave her one of her most loyal followings. I look forward to reading your thoughts about the remasters, and how they compare to other issues of the same recordings. 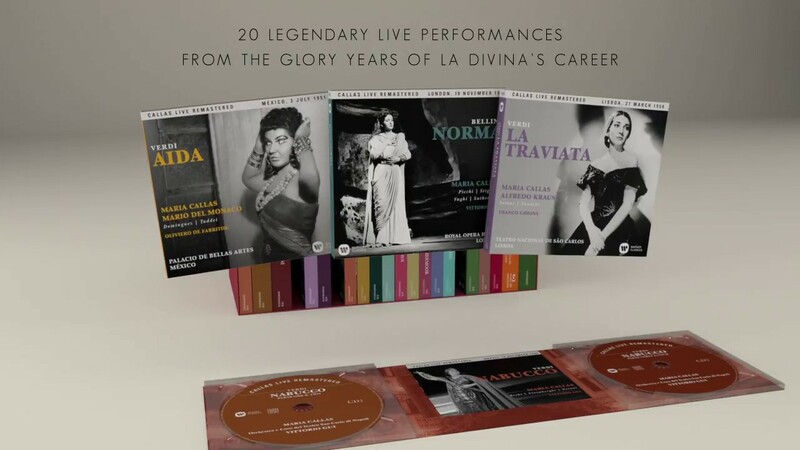 I think I will cherry pick from these releases instead of buying the whole box, and go for the operas that either sound best or have not otherwise been recorded in full by Callas, like Macbeth. "Comparing us is like comparing champagne with Coca-Cola"
It is by eating our spagetti that Callas lost half her weight. The Tebaldi quote is a misappropriation. Apparently Callas said in an interview that their repertoires were completely different and that comparing them was like comparing champagne with cognac. It was someone in the audience, who quipped. "No, Coca-Cola!". The mis-quote has dogged her all her life. As for the pasta company, she (rightly) sued it for falsely, and illegally using her name. I'd be very eager to know your thoughts as well. I'm streaming Anna Bolena via Apple though my Bowers & Wilkins Zeppelin, so hard to guage accurately, but seems pretty impressive. However, I agree, the Divina Records have been the benchmark for some time. Discussion is raging on the Talk Classical forum as to which of the sources is best. In the final analysis, it will depend on how acute your ears are, and on your listening equipment. Most contributors seem to be of the impression that the Divina Anna Bolena is still the one to have. I haven't got round to listening to that yet, so can't compare. So far I have only listened to the Nabucco and some of the Parsifal. The Nabucco is definitely better than any other I have heard so far (though Ars Vocalis has recently issued a version, which is also very good) and the Parisfal sounds better to me than my old Gala version, though it favours the voices over the orchestra. As it's the voices I'm interested in, this is fine with me. People were worried that Warner would just use the old, not very good, EMI sources, but, for the most part, this appears not to have been the case. They don't appear to have been able to do much with the ropey sources for La Vestale, Alceste and Andrea Chenier. I have my doubts about certain choices. I'd have gone for the La Scala 1955 Norma over London 1952, and probably preferred Cologne 1957 La Sonnambula over La Scala 1955. I also prefer Covent Garden Traviata to Lisbon (both 1958). I wonder why they chose to include the rather rough and ready Mexico Rigoletto, especially given the excellence of the studio recording. 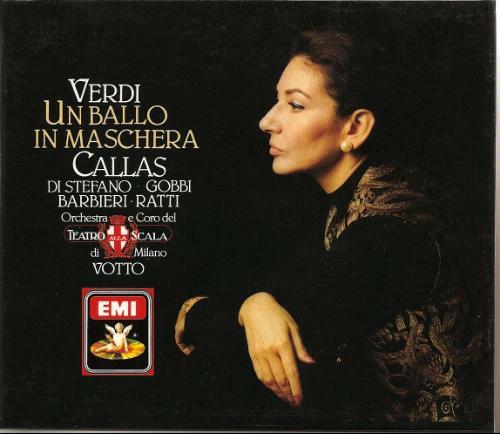 Why not the brilliant La Scala Un Ballo in Maschera of 1957, which is also in pretty good sound? I think I'd also have gone for the Dallas 1958 Medea in preference to the 1953 Bernstein La Scala one, but just by a whisker. The booklet is a bit unexciting, and the leaflets accompanying each set include essays on the operas themselves, which I assume most purchasers would already be familiar with. I'd have preferred something on the production and the provenance of the recording. A CD-ROM with libretti and translations would also have been useful. Not a total success, then, but not bad for the price. 2) Divina Record issue which uses the same performance as a source. 3) An excerpt released by Warner in the Callas rareties disc which was recorded in Nov 1961 at Kingsway Hall and is not a live performance. Thank you! FWIW, I listened to excerpts from both the new Warner master of Anna Bolena and the Divina mastering, and defintely prefered the Divina. Even streaming through my Zeppelin, the Divina was less muffled and Callas' voice had more clarity. As before, my guide is Sir Denis Forman's sublimely witty and fond review of opera. My preferred version is this remastered 1956 recording *with a stellar cast led by Maria Callas. Nobody does "tormented" like Maria Callas. She could sing "These Are A Few of My Favorite Things" and make it sound so harrowing that the Von Trapp kids start wearing black and cutting themselves in the Hot Topic bathroom. Very amusing. However I would not agree with him when he says the Love Duets are not the highlight of the opera. The great Act II duet is one of the greatest in opera. There is a superb live Callas recording of the opera too, in not bad sound, from La Scala in 1957. Callas and Di Stefano repeat their roles, Bastianini is Renato and Simionato Ulrica. Gavazzeni is a rather more propulsive conductor than the routinier Votto. I compare the two Callas sets on my blog. If onlu I could get to see it, but so far no signs of a UK release, though there are vague rumours about some time in March. The film is available on Amazon UK, but there appear to be different versions available, with narrations in French or English (Joyce DiDonato does the English one) and there seems no way of telling which you are buying. I would have thought that it would have been possible to publish just the one version and give the viewer the choice of which narration they would like, but that doesn't seem to be the case. Altogether a rather shoddy way to treat one of the greatest artistic phenomenons of the twentieth century. This documentary is available here in Spain on cable TV (I saw it with narration in French). It is more a tabloid press overview of Callas”s life (Onassis and all that...) than a survey of her artistic achievements. Actually, it’s almost counterproductive; e.g. her affected and artificial English diction (a girl from from New York speeking as if in a period melodrama from the 1930s) was really something. Even an admirer of Callas’s art as myself couldn’t help being reminded of Diana Vreeland‘s quip (perhaps apocryphal, as Mrs. Vreeland was a great admirer of Callas, and I’ve been unable to locate the quote since I read it many years ago). I paraphrase: “Onstage she was divine, but at a dinner table she was as common as muck”.